Reminders of the fragility of our bodies are unavoidable. You just have to hope that your next injury won’t be too painful or long-lasting. My most recent started in 2014, with knee pain. It felt like a little electric shock to the outside of the knee joint. At first it was the odd jab, the kind you half-ignore, hoping that it will go away. But over 18 months it became two hours of pain each time I exercised. Then an all-day, everyday event that might involve a hundred or more of these stabs. They’d often awaken me in the middle of the night. I stopped exercising, and became depressed. The pain contributed to my leaving a job. But the solution was simple. An MRI scan confirmed my WebMD-style self-diagnosis of a meniscus injury. After waiting a month for a physio appointment, I had the solution: a rubber band. It’s the simplest of medical technologies. Two weeks of basic physiotherapy exercises with a resistance band solved a two-year pain problem. Our bodies may be fragile, but they’re adaptable, too. Since then, I’ve had an interest in technologies that interface with the body in some way. I have spent the last decade writing predominantly about consumer technology, and much of it can seem thin: monitoring your resting heart rate with a smart watch is merely an interesting curiosity. Fitbit’s marketing of the pedometer, a device which I used to think my grandfather was strange for carrying around 25 years ago, was clever. But where’s the really human stuff? I thought that I might find some of it among the body augmenters, a subculture I was asked to research for a writing assignment a couple of years ago. Some of these biohackers and self-identifying cyborgs have great stories. However, what I saw were “bedroom” surgeons who often risk sepsis, and who, for the most part, move within insular online communities. Where’s the cultural benefit, or sense, in implanting a ring of LEDs under the skin of your hand so that you can tell where magnetic north is? Unexpectedly, though, I found some of the most meaningful technological innovation that I’ve ever seen in a very different place: hospitals. I come from a family of doctors, you see. My mother is a family physician and my father a research scientist, and two brothers are doctors in hospitals. Some might say that makes me the family failure. (Others would be more polite.) Whenever I’ve watched my family at work, medical care computer systems have seemed perpetually ten years out of date. The combination of constant underfunding and a sensible, clinically-driven approvals process also leads medical facilities to adopt new administrative technology at a conservative rate. Nevertheless, hospitals are where I’ve found some of the most “human” ways of augmenting the body. Materials scientist and engineer John A. Rogers of Northwestern University is currently redesigning the neonatal intensive care unit (NICU). That’s the ward where very premature babies, and those in severe distress, end up. My own brother — one of the doctors — was critically premature. How he could “fit in the palm of your hand” is one of the stock phrases that my dad occasionally brings up at family get-togethers, usually after a couple glasses of wine. Like many babies that premature, my brother almost died. In a speech that Rogers gave to the MIT Lab ApplySci conference in 2017, he described even the “most advanced” intensive care units as “a rat’s nest of wires.” People are covered in cabling, tape, hydrogels, and coupling gels, which hold sensors in place and deliver data to medical equipment by the bedside. But, as he argued in his talk, this is very un-human. It “frustrates the mother-child skin-to-skin contact” that’s so important for very young babies, for example. In order for parents to hold their own babies, these sensor patches have to be removed. “For early-term babies, the skin is very fragile, it’s hardly even skin,” said Rogers. “Applying and removing these adhesive tapes over time can lead to a lifetime of scarring.” The essential technology of the NICU augments the body, but it compounds the stress of the situation for parent and child. However, flexible sensors developed by Rogers allow the “nest” of wires to be replaced “with two or three patches.” These are powered wirelessly — so no wires, nor even a battery. The patches are a result of Rogers’s nearly 20 years of research into flexible electronics. And unlike a lot of the promising medical technology I’ve encountered over the years, which is often in pretrial research form, these patches are already in use, at Lurie Children’s Hospital of Chicago. 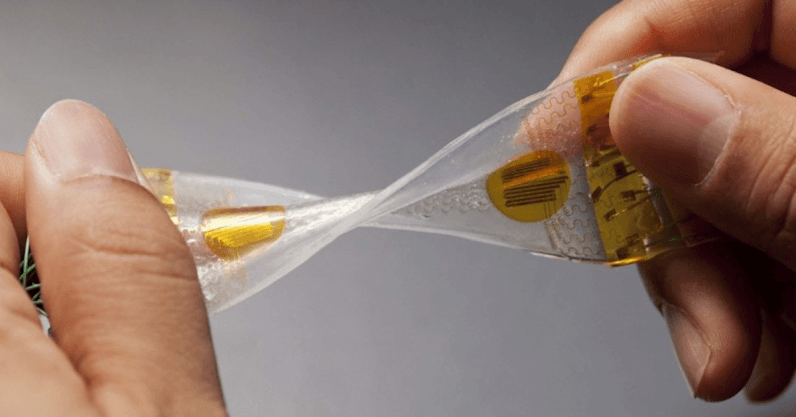 The fundamental innovation of these sensors is that they are stretchy and flexible, unlike the silicon wafer base of traditional electronics (which also tends to be the working material for sense hackers and body augmenters). Silicon fractures under a tensile strain of only one percent, making it largely unsuitable for use with our elastic, pliable skin. Rogers’s work is also behind new sensors for stroke patients in recovery. Strokes are caused by bleeds or clots in the brain that cause cell death. Partial paralysis is a main effect, as is aphasia, which can deteriorate or destroy one’s ability to understand language — this is a life-changer for anyone, particularly someone, like myself, who earns a living writing. Elissa Newport, a neurologist at Georgetown University, suggests that there may one day be a pill to radically increase the plasticity of the brain and let it rewire itself. This would give stroke patients the fast-learning ability of an infant. However, current rehabilitation methods are “manual.” Patients use speech and language courses, and often painful physiotherapy, to relearn simple tasks that they may only recently have considered entirely intuitive. The first six months after a stroke are widely cited as the window for most rapid recovery. However, as one 2016 study found, most people who are prescribed a rehabilitation program after a stroke finish it before the six month mark, meaning they could be missing out on potential further gains. Even more worrying, many patients never even finish those rehabilitation plans, because they are discharged from hospital early, and follow-up care is so inconsistent. One in three patients develops depression in the five years following a stroke, and people are often left feeling abandoned when they can’t access high-quality rehab services. My instinct, as a relatively healthy person, is that I would push through post-stroke physical and mental exhaustion, and pain, to recover what faculties I previously had. But my own motivation and mood were dissolved by a fairly simple, common knee injury. What hope would I really have after a major medical event? Together with Rogers, the Shirley Ryan AbilityLab, in Chicago, has developed a series of high-tech sensors. They’re designed to help with common problems patients have with stroke recovery, such as motivating themselves. “We measure their speech, their swallowing capability, the movement of their upper and lower limbs, their sleep quality, how they recover during therapy or how they handle different types of therapy,” says AbilityLab laboratory director Arun Jayaraman. There are sensors for the neck, ones for the legs and arms, and a patch worn on the chest to monitor heart function. Like a fitness tracker, the system uses a gyroscope and accelerometer combo for motion monitoring. Mechano-acoustic (vibration) sensors in the patches worn on the arms and neck can also record speech, muscle activity, and swallowing. In a clinical setting, such sensors would be wired in, attached to external. But, by shrinking the array into a wireless bandage-like form that can be worn at home, AbilityLab researchers have figured out how to fill in the gaps between the “islands of care,” as regular checkups are known to health care professionals. “One of the biggest problems we face with stroke patients is that their gains tend to drop off when they leave the hospital,” says Jayaraman. Although these sensors are new, researchers hope that they can help with this problem. Some patients can resist being remotely-monitored as an invasion of privacy, but for others it can reduce the feeling that they’ve been forgotten — something that is also a significant problem. Many of today’s health technology headlines focus on big data, such as stories about U.S. health care providers using Apple HealthKit to track the medical records of millions. However, specific problems need specific solutions. Rogers’s ICU sensors and similar projects remind me that, while technology can often feel oppressive, a kind with real humanity inside still does exist. This story by Andrew Williams originally appeared on How We Get To Next, a non-profit project interested in exploring the intersections between science, technology and culture, and how those things are changing the future. Follow them on Twitter, Facebook, and subscribe to their newsletter.